SABIC’s Innovative Plastics business is showcasing here at PLAST 2012 its broad and deep portfolio of industry-leading sustainable materials that help customers design, develop and differentiate environmentally responsible products in three key ways. These include: cutting weight to lower energy usage; reducing waste and carbon dioxide (CO2) emissions through up-cycling of post-consumer plastic; and providing exceptional flame-smoke-toxicity performance without the use of halogenated additives. Teaming up with Guzman Global, SABIC’s distribution partner in Italy, the company is exhibiting these resin solutions at the Guzman Global stand, Hall 9, Stand B61, with a theme of Sustainability + Performance. Working with Guzman to supply its high-performance engineered materials – combined with unmatched technological expertise and value-added services – SABIC is committed to helping customers advance their sustainability objectives and power their competitive advantage with solutions for more sustainable design. Guzman Global has been working with SABIC since 1988 as its official distributor in Spain and Portugal. As SABIC’s distribution partner in Italy as well, Guzman provides SABIC’s full portfolio of materials along with technical support, to small and mid-sized molders and manufacturers. • Lexan* BFL 4000 polycarbonate (PC) resin is a high reflective material that is a strong candidate to replace metal in such applications as automotive lighting. It requires only one step to metalize and enables part integration. • Ultem* carbon-fiber-filled polyetherimide (PEI) resin, structural foam and textile fiber can slash part weight by up to 50 percent to reduce fuel consumption, particularly in aircraft interior and transportation applications. The incorporation of post-consumer recycle (PCR) materials is an important component of SABIC’s sustainability strategy and another example of the company’s proactive approach to changing customer needs. Up-cycling, which is a chemical vs. a mechanical process, extracts the feedstock in its pure form, helping to ensure the high performance of materials containing PCR content. Award-winning Valox iQ* resin is based on polybutylene terephthalate (PBT) that uses post- consumer polyethylene terephthalate (PET) feedstock. It is up-cycled via a proprietary chemical process into a new engineering plastic for electronics and automotive applications, converting a waste product whose life was measured in weeks, to an engineering resin for durable products with lifetime measured in years. Valox iQ PBT resin helps to divert waste from landfills, and provides up to a 49 percent reduction in both CO2 emissions and process energy utilization per kilogram of PBT. Further, Valox iQ resin provides molded-in color capability to replace painting, which can add cost and pose an environmental hazard from volatile organic compound (VOC) emissions. For example, Leviton Manufacturing, a North American leader in electrical devices and systems, selected Valox iQ resin for the housing of its Evr-Green™ electric vehicle (EV) cord set, a portable charger for EVs. 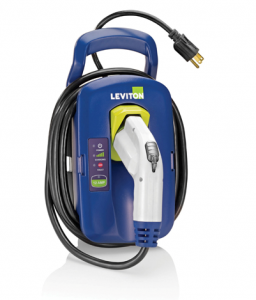 Molded-in color capability of the resin avoids secondary painting and significantly enhances the environmental benefits of the Leviton charger. Also, Volvo was the first to use an up-cycled plastic resin in a North American truck. Volvo selected Valox iQ resin for the brackets of the side air deflection system for all seven models in the 2012 Volvo VN platform of heavy trucks. Valox resins also enable soft yet resilient monofilaments, staple fibers and continuous filament yarns for woven and nonwoven fabrics. Valox fiber provides excellent dyeability and colorfastness, extremely favorable stretch and recovery when compared to PET resin, and high chemical resistance. This fiber can be used to develop filtration fabrics, performance apparel such as swimsuits, stretch fabrics and monofilaments. The new Valox iQ 2205HV resin is highly effective in dispersing pigment throughout the polymer melt in fiber production to produce consistent, vivid colors – what the flooring and carpet industries call “color pop” – with lower loadings of expensive colorants. This environmentally-progressive, high-performance resin is used as a critical additive to provide permanent stain resistance keeping an attractive appearance and helping prolong carpet life and maximize PCR content. Innovative Plastics is a global leader in flame-retardant (FR) materials that help our customers meet ever evolving environmental and eco-label standards through the use of non-brominated, or in some cases non-halogenated, products. Our products help our customers comply with major directives such as the European Union’s (EU) Restriction of Hazardous Substances (RoHS) and with voluntary standards such as the EU Eco label. Ultem resins, known for high heat resistance and strength, offer inherent FR performance without additives. Ultem resin grades are exceptionally difficult to ignite, with a limiting oxygen index (LOI) of 47 percent, and meet UL 94 V0 specifications in sections as thin as 0.25 mm for glass-filled grades. Ultem resins emit extremely low levels of smoke per the National Bureau of Standards (NBS) and the National Institute of Standards and Technology (NIST) smoke evolution test. Ultem fiber is based on Ultem resin and also provides these properties along with exceptional light weight and excellent aesthetics for many FR applications in aerospace, rail and home fabrics – including carpets, kick panels, seating and wall coverings, curtains and bedding materials. This fiber can also be used to create a variety of non-woven solutions for the transportation industry, including insulation blankets, wicking felt, seat fire blockers and cushions. Woven fabrics incorporating Ultem fiber, such as those used in safety and protective work wear, can be colored using conventional exhaust dyeing techniques, resulting in exceptional colorfastness and resistance to ultraviolet (UV) light. Fibers made from Ultem resin are softer and less abrasive than those made from conventional aramids, giving converters better control over system costs by reducing the stress on textile machinery. Plus, PEI fiber can be blended with other natural and synthetic fibers to provide OEMs with an optimal balance of performance and cost efficiency. Lexan CFR copolymers also offer exceptional flame retardance plus high flow for clear, ultra-thin-wall parts. Consumer electronics and appliances continue to shrink in size and thickness, calling for new materials that can provide excellent FR performance at ever-thinner gauges. Lexan CFR copolymer meets a previously unmet market need by giving consumer electronics and appliance manufacturers a clear material with superior flame resistance at very thin gauges compared to competitive products, enabling customers to create the next generation of thinner, lighter-weight products. SABIC will also be showcasing materials from their broad portfolio for customers where toughness is needed to provide a longer life span. Lexan LUX resins offer an excellent solution for light emitting diode (LED) applications such as light guides and lenses. Efforts to raise the continuous operating temperature of LED lights for increased light output are placing new demands on plastics used in these applications. Long-term color stability and retention of light transmission performance under the influences of heat and light are becoming more critical. The Lexan LUX resins portfolio also offers a choice of flow characteristics for a variety of LED applications including automotive light guides and inner lenses and general lighting lenses. Moreover it can be a potential material of choice for furniture, extrusion and building and construction (e.g. windows, panels that require clear light transmission). Lexan HFD (high flow ductile) copolymer is made of a minimum of 10 percent castor oil and offers high flow while keeping the toughness property that Lexan resin is known for. Although Lexan HFD is produced in part from bio-content, its true sustainability value is its combination of high flow and durability. Customers using Lexan HFD resin can either design thinner parts with the same durability, thereby reducing resource consumption, or they can design products that may be more durable and last longer. Lexan HFD is a potential fit for the optical market (e.g. lenses, glasses, visors) and lighting fixtures. For additional information on SABIC sustainability solutions, please go to www.sabic-ip.com. For technical product inquiries, please contact us at www.sabic-ip.com/prtechinquiry. Saudi Basic Industries Corporation (SABIC) ranks among the world’s top petrochemical companies, and is a global market leader in the production of polyethylene, polypropylene, advanced thermoplastics, glycols, methanol and fertilizers. SABIC manufactures with a global footprint in Saudi Arabia, the Americas, Europe and Asia Pacific. The company operates in more than 40 countries across the world with 33,000 employees worldwide. It has significant research resources with 18 dedicated Technology & Innovation facilities in Saudi Arabia, the USA, the Netherlands, Spain, India and China. SABIC recorded a net income of SR 29.21 billion (US$ 7.79 billion) in 2011, and sales revenues totaled SR 190 billion (US$ 50.67 billion). SABIC’s Innovative Plastics strategic business unit is a leading, global supplier of engineering thermoplastics with an 80-year history of breakthrough solutions that solve its customers’ most pressing challenges. Today, Innovative Plastics is a multi-billion-dollar company with operations in more than 35 countries and approximately 9,000 employees worldwide. The company continues to lead the plastics industry with customer collaboration and continued investments in new polymer technologies, global application development, process technologies, and environmentally responsible solutions that serve diverse markets such as automotive, electronics, building & construction, transportation, and healthcare. The company’s extensive product portfolio includes thermoplastic resins, coatings, specialty compounds, film, and sheet. Innovative Plastics (www.sabic-ip.com) is a wholly owned subsidiary of Saudi Basic Industries Corporation (SABIC).